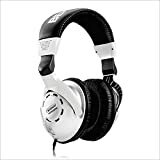 The HPS3000 Studio Headphones manufactured by Behringer are of a high performance and produce a superb frequency response which meets high demands of professional studio users. The bass that is produced is of a sheer quality aswell as the transparent highs. The headphones feature oval shaped ear cups and an ultra-rugged headband showing the time that was put in to constructing a comfy and impressive pair of headphones.